Our “swiss watch” solutions make use of every inch in two projects spanning a decade. 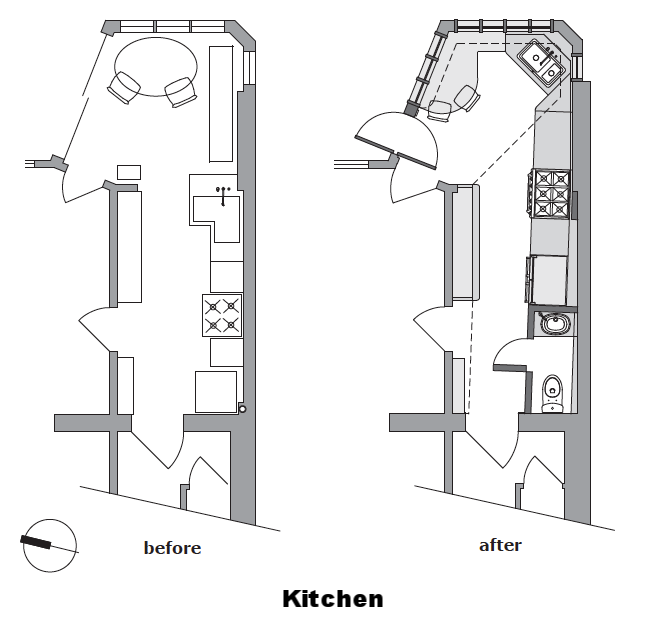 The result is the transformation of two key spaces in a narrow rowhouse in Geneva. We were asked to remake the narrow kitchen into a cook’s paradise while maintaining dining options and porch access, increasing storage, and finding more space for a needed bathroom. Here, a slight angle opens the kitchen up towards the view, while the powder room is concealed within the wall of cabinetry. Horizontal lines lead the eye towards the chopping, washing, lingering end, and to a spectacular lakeview. Directly above the kitchen, we puzzled out the function of a split-level bath with a second door from the bedroom level swinging open two feet above the bathroom floor! The resulting geometry - along with the layered horizontal planes of the stairs, tub-surround, shelving, counter, sill and trim - unify and define the visual experience. The results are clean lines and a sense of repose.